While having a little reorganization of my beauty archives the other day, I got to thinking about what items from the brand are my favorites, and what advice I would give to someone entirely new to the brand. First off, here is what I have tried from the line: Marc Jacobs Genius Gel Foundation (pictured above is my second bottle of the stuff), Marc Jacobs Lust for Lacquer Lip Vinyls in a few colors, Marc Jacobs Lovemarc Lip Gel in Roleplay, Marc Jacobs Style Eye-con No. 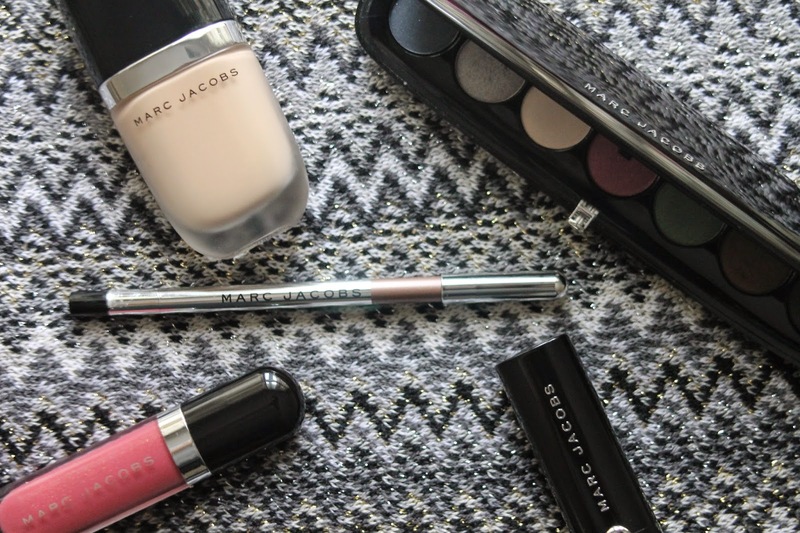 7 - Plush Shadow in the Vamp, and Marc Jacobs Highliner Gel Eye Crayon in Ro(Cocoa). I can only speak from my experience with the products I mentioned, but let me tell you, overall I have been pretty impressed by the brand. For reasons I'm not quite sure of myself, I was not expecting much more than awesome packaging when it came to this line, so I was pleasantly surprised by the quality of the formulas. When the range first hit Sephora stores a little over a year ago I couldn't resist picking up a few pieces to try. I purchased the eyeshadow palette and a lipgloss, and out of the two, only found the lipgloss to be a must have for me. Unfortunately, I consider the eyeshadows to be the lowest performing of all the products I have tested from the brand. I find them to be a bit patchy when applied, and I'm not sure if it was a poor color choice that left me wanting more, but I have been afraid to try them again ever since. You know, considering they're not exactly a bargain purchase. On the other hand, having literally been lost in the world of foundations, I resorted to being matched in-store and after being handed a bottle of the oil-free goodness that is the Genius Gel, I fell in love. I used up an entire bottle before New Years rolled around - the finish is a long lasting, satiny matte that leaves the skin feeling plumped up from the added anti-aging skincare ingredients. My most recent addition from the brand is the Highliner eyeliner, which has quickly risen to the top of my eyeliner ranks, gracing my tightline nonstop over the past few weeks. The formula is a non-drag gel texture that doesn't budge once it has set, making it perfect for those often long week days. Yes - go for the lipstick :) and now you have made those nail polished go onto my list as well!